It’s been awhile since I posted wedding details! I guess it’s because every time I roll out the wedding pictures to look through, I get totally swept away in daydreaming about the special day. 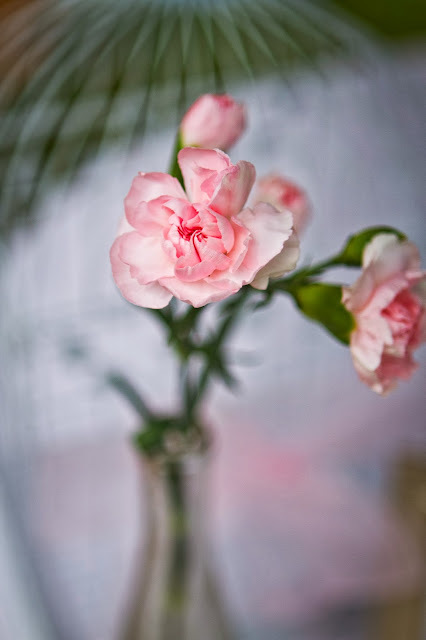 I love looking through the pictures! 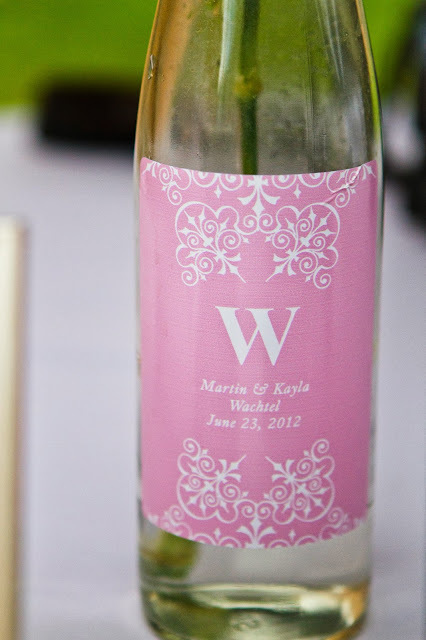 Today I want to share the personalized wine bottle labels we used. These were not a detail that I planned. My mom actually ordered a few things from the Oriental Trading web site for my bridal shower, and she stumbled across the wine labels and ordered them. They come in a pack of 12 for $8.00, and you personalize the names and date. They have a lot of different color options on their website too. Here is a link to the pink ones we used. And here is a closer picture of what ours looked like, complete with our names and wedding date. Now if you’re worried about the quality of these- they were not at all “cheap.” They stuck really well. In fact I wouldn’t recommend using them on a bottle unless you wanted them on permanently. 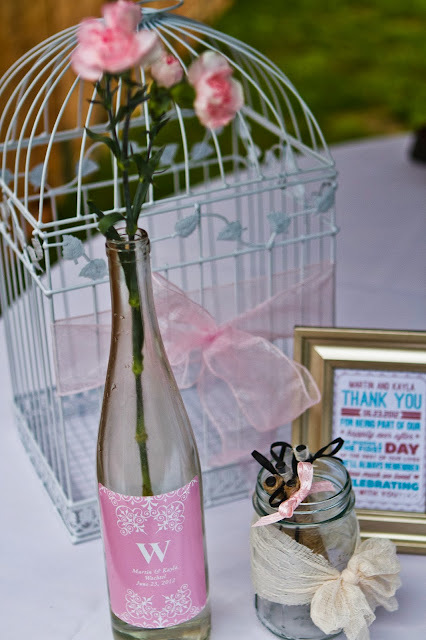 I had saved wine bottles for the wedding, so they worked perfectly. Plus- I got to keep them as a keepsake afterward, and they are displayed in my home right now. 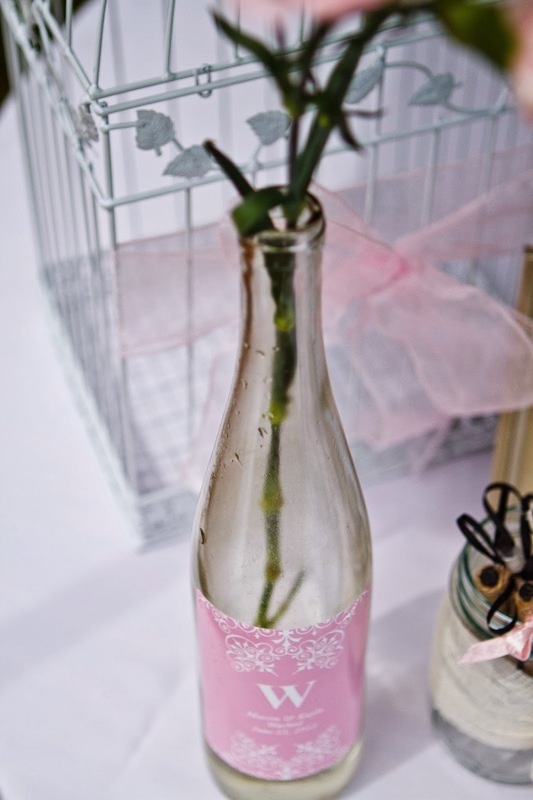 We put pink carnations in the wine bottles. Easy and very inexpensive. After all, it’s the little things in life.